What do asteroids and geckos have in common? Not a lot, as you’d expect, but they may share a common force. This rather strange notion comes from research being done by a team of University of Colorado scientists who have been studying the odd nature of the asteroid Itokawa. When the Japanese Hayabusa mission visited the space rock in 2005 (Hayabusa’s sample return capsule is set to return to Earth on June 13th by the way), it noticed the asteroid was composed of smaller bits of rubble, rather than one solid chunk. Although this isn’t a surprise in itself — indeed, many asteroids are believed to be floating “rubble piles” — the rate of spin of the asteroid posed a problem. Itokawa spins rather fast and if only the force of gravity was keeping the lumps of rock together, they would have been flung out into space long ago. In short, the asteroid shouldn’t exist. Although plenty of theories have been bandied around, one idea seems to stick. More commonly found as a force that holds molecules together, the van der Waals force may bind the individual components of the asteroid together, acting against the centripetal force caused by its spin. But where do the geckos come in? Geckos are highly skilled in the “climbing up walls” department, and it’s the van der Waals force that makes this happen. Should the body of a gecko be tilted in such a way against a perfectly smooth, “impossible” to climb surface, the gravity acting on the little creature will trigger the force into action. Therefore geckos have evolved to exploit the practical application of van der Waals. This has some rather interesting ramifications for asteroid evolution too. During early stages of asteroid formation, the larger fragments of rock are flung off; the centripetal force exceeds that of gravity. In the latter stages of development, only the smallest rocks remain behind, their mass small enough to allow van der Waals forces to overcome the spin. 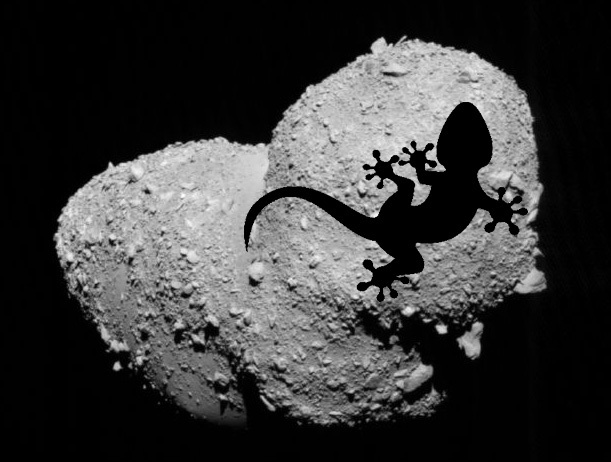 Thanks to my Discovery News colleague Jennifer Ouellette for drawing the comparison between asteroids and geckos!